Summer school in Bethnal Green, 1971. 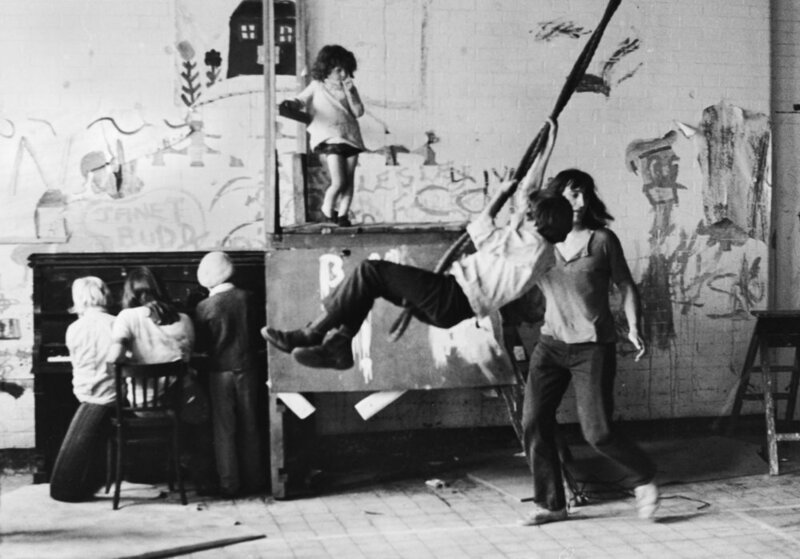 Summer school in Bethnal Green 1971. The Times Educational Supplement of U.K. wrote that,” in most cities in England groups got together in the summer holidays, found spaces and made a place for children to go to learn, play and expand”. This one was in a disused fire station with a dozen rooms. Local people provided milk, dressing up clothes, books, fruit and paints. Students, artists and teachers went along to work and play with the children. ”If the movement grows”, wrote the journalist, “and spreads into non school time, and even merges with school, it could do more than any number of pre-school “compensatory programmes”, giving people a head start which can be kept up”. What a great idea ! A movement began for summer schools in 1971 and quickly grew.The T.E.S. wrote that in most cities groups got together, found space, and made a place for children to go and learn, play and expand. This one was in an old Bethnal Green fire station with a dozen rooms. Local people provided milk, dressing up clothes, books, fruit and paints. Students, artists and teachers went along to work and play with the children. The T.E.S. wrote that if the movement grew and spread into non-school time, and even merged into school, it could do more than any number of pre-school “compensatory” programmes, giving children a head start that could be kept up. Sounds great doesn’t it ? After running for 8 weeks at the RSC’s Aldwych Theatre and at Stratford upon Avon, the highly praised production of Nicholas Nickleby, adapted by David Edgar, transferred to Broadway, New York where it was equally successful. The part of Nicholas was played by Roger Rees, (main figure), and Smike was played by David Threlfall, with Ben Kingsley as Wackford Squeers. Snoo Wilson was one of the most interesting playwrights in the U.K. This was first performed at the Royal Court Theatre, London in 1978. 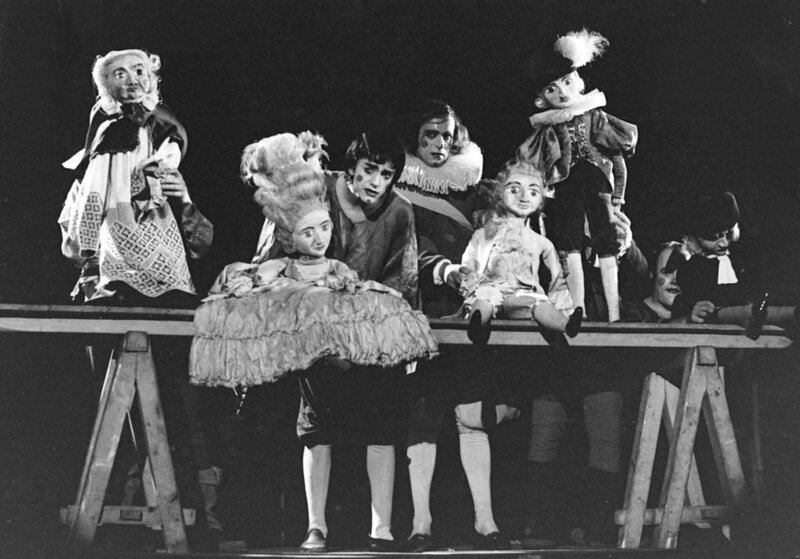 Ariane Mnouchkine brought and directed the Theatre du Soleil from Paris to perform, “1789, First Year of The Revolution” in the “Roundhouse Theatre” in 1971. It was performed by actors, acrobats, puppeteers and story tellers. Hugh Quarshie took over the part of Hotspur, in Henry IV parts 1 and 2 at the Barbican Theatre in 1982. The director, and then artistic director of the R.S.C., Trevor Nunn, was one of the earliest British theatre directors to cast black actors in parts usually assumed to be for white actors. Deaf and Blind pupils receiving one to one tuition. Deaf and partially sighted children receiving one to one teaching at a school in Walthamstow, London, in 1990. The main focus was on developing all senses, and great emphasis was put on tactility, and amplified sound where appropriate. It was an inspiring place to visit. The children were clearly thriving thanks to the hard and enthusiastic work of all the teachers. School for children with sight & hearing difficulties. Two children play at bathing their dolls to develop their interactive skills at a school in Walthamstow, London. School for children with sight and sound difficulties. One to one attention helps children who are in different degrees handicapped with hearing and seeing, communicate and interact with the world. School for children with sight and sound problems. Emphasis on tactility was one of the ways that teachers in a school in Walthamstow, in London, helped children who were without full sight or hearing. Visual stimulation of child with sight difficulties. One to one attention with child who had visual handicap, in order to develop his ability as much as possible. Saying good morning one by one. Every morning pupils at a school for children with difficulties in sight and sound, sat in a circle and passed the loudspeakers round. Each child was played a tune which he /she identified with, and was encouraged to say or signal “Good Morning” to all the others. Blind pupil practiceing tactile skills. In a school in Walthamstow, London, the children who had sight and sounds difficulties received one to one attention to develop all senses. This child is practiceing on his own after playing with treacle with a teacher. Helping child with severe seeing difficulties. Even eating can be a problem when you are deaf and almost blind. This child is getting one to one attention to develop her skills in this area. The Three Sisters RSC 1981 touring production. In 1981, the R.S.C. toured Chekhov’s Three Sisters in a production by Trevor Nunn. Left to right are Susan Tracy, Emily Richard, Suzanne Bertish and Janet Dale. Tara Rajkumar gives a workshop on Indian dance to children in a Willesden, London school, as part of the Theatre In Education initiative promoted by the Arts Council of Great Britain. This scheme covered the all arts and visited many schools all over England & Wales. Pupils at Collingwood School, London, working with the Cockpit Music Ensemble, with Grahame Dudley who founded the ensemble. Until teachers and pupils take over the workshops, the ensemble returns each week to lead the sessions. They set aside two days each week to visit four scholls. This was in 1972. Alan Hacker plays Conch in Prom. John Shane, Poet in school classroom visit. John Shane,poet, seen reciting poetry in a school classroom in the 1970s as part of the T.I.E. initiative promoted by the Arts Council. Strikers demonstrate in Smith Square, London, 1972. Workers from the Imperial Typewriter Company demonstrated outside their union headquarters in Smith Square, London. They were demanding fair treatment in promotion in its factories. 1972. Demonstration against a showing of an N.F. film. Demonstration against the showing of a film made by the National Front, far right organisation, called “England Our England”, in Chelmsford, 1972. Weight training at the Sobell Centre, Islington in 1983, for the book, “A Day In The Life Of London”. Burger Bar at Chelsea Flower Show. Staff hard at work at a burger bar in the Chelsea Flower Show, May, London, 1963. Anxious mothers watch their children enjoy the thrills of a fairground roundabout on Blackheath, Easter, 1963.